The match and the (promotion/demotion) scenario was still on a knife-edge. Kenya served the target of 178 runs ahead of Nepal, given the worst show of Nepal’s batting in the tournament, there shouldn’t have been much ground for Nepal’s optimism. Yet there was because one tall guy was sitting in the tent taxed dugout, waiting for his turn. Anil Kumar Sah caught by the wicketkeeper in the second over itself, Nepal’s fans were broken and frustrated but it was immediately healed after Paras Khadka joined the crease. Kenyan were shouting loud after the first wicket but paused quickly after Khadka stepped out of the dugout to joined the crease. When he’d done that in the previous match, he’d carved a gem out of granite. Kenyans were happy but not overly jubilant, Remembering the worth of Nepalese skipper’s wicket. Gyanendra Malla and Dipendra Singh Airee couldn’t hold long with skipper as they departed very quickly. Nepal were on (14-3), Nepal’s fans were frustrated but deep down still had some faith over their skipper. Nepal’s condition was worst than worst but thousands of Nepalese fans were tweeting faithful status over their skipper. As long as Paras Khadka was there, the target looked surmountable. The pitch, the bowlers, the match situation were all irrelevant. As far as Nepal’s fans were concerned, their skipper could inexorably bring his side back into the game. Last time Khadka had pulled out the match of his side, after were reduced to (20-3) to chase down 115 runs, with blistering 51(48). Literally, Nepal’s fans were all done with the match, but emotionally they were still holding breath with their skipper and Sharad Vesawkar on the crease. The old fears, the pains of the past travails on the road wouldn’t dare rear their heads just yet. For half an hour, fans egged their man on. He was looking on touch with 42 runs off 43 balls with 3 fours and two sixes but 44th ball brought the curtains down to all the hopes of Nepalese fans. Odhiambo pitched bowl on the back of good length, Khadka mocked it, edged it to wicketkeeper Kiram. Sharad Vesawkar, Aarif Sheikh, and others were still there to play. But target then seemed further away than before. The pitch, the bowlers, the match situation had become very relevant. 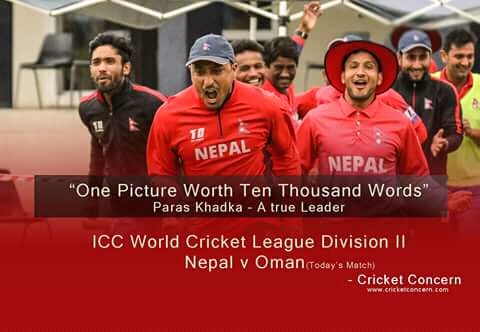 The qualification scenario, the pain of batting collapsed, frustration over the match all started to fill Nepal’s fans tweeter handle. The Kenyan were all delighted and smiled. Thanks to 87 runs stand between Aarif Sheikh and Rohit Kumar Paudel which sealed Nepal’s victory.